Everyone loves the pool, but if you’re looking to mix things up a little, these unique water toys for kids are sure to do the trick. 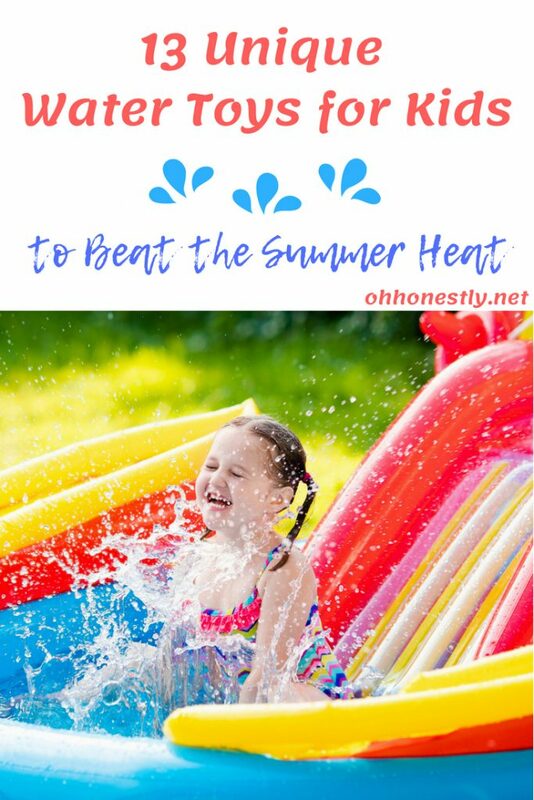 From crazy squirt guns to the coolest slip ‘n slides, your kids can use these fun water toys whether you have access to a pool or not. I’d be willing to bet you’ll even want to get in on the action! The fact that these water guns come in a six pack and are low priced make them the PERFECT water toys for when you’re planning a big get together. If your child dreams of being a fire fighter, she’ll love this fire hydrant sprinkler. These may not be cheap, but if you like playing with water balloons, they’re worth every penny. We’ve used them several times and they are so incredibly easy to fill. Forget the local splash pad! Create one in your own backyard with this fun water toy. For the kids who love a good competition, this racer slip ‘n slide should do the trick. I gotta be honest, this looks a little dangerous to me, but maybe your kids would love it. This splash park is perfect for the baby and toddler set. And this slip ‘n slide baseball field is perfect for the older set. All the fun of a beach ball without all that pesky sand. These water guns are perfect for a battle. Technically this science kit won’t beat the summer heat, but it’ll make learning fun and you can keep the mess to a minimum by doing the experiments outside. This is a fun twist on the classic sprinkler. If your kids are like mine and lose things easily, this might be a good toy for you. The canister can be replaced with a standard soda bottle.